On desktop, you can explore a 360 video with your arrow keys, mouse, or trackpad. On the right side of the player, you’ll see a compass that indicates the direction you are facing in the video. Clicking on the compass will reorient you to the original positioning of the video. On the Vimeo mobile app for iOS or Android, tilt your device to enjoy 360 video. You can also move horizontally through a 360 video by dragging your finger across the screen. If you try viewing a 360 video on the Vimeo mobile site for iOS or Android, we’ll direct you to the mobile app for the best viewing experience. Some 360 videos are best enjoyed in a headset, based on how the creator shot the video and intended it to be viewed. On Android or iOS, you can use the Vimeo app to view 360 video in a mobile headset. To enable headset playback, tap the headset icon within the player on the Vimeo app. If you are watching on an Android mobile browser or embedded on another website, the headset icon will direct you to our app where you can use a headset to view your 360 video. If your headset has a QR code, you can scan it by tapping the headset icon, clicking the gear icon in the player, then selecting “Switch viewer: default cardboard.” After scanning the QR code with your device’s camera, the viewing experience will be optimized for your headset. If you’re underground, in the air, or your wi-fi’s just a bit spotty, you can download a 360 video to watch offline, and enjoy it at your command. On the Vimeo mobile app (iOS or Android), visit your settings and enable “Allow HD downloads.” We also recommend enabling the “Download only via WiFi” setting, because the 360 videos can be as large as a gigabyte. 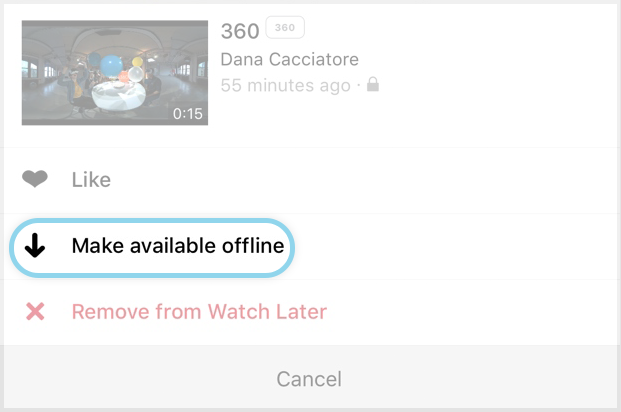 As you’re browsing the Vimeo mobile app, you can tap the ellipsis next to the video title of a 360 video and select “Make Available Offline.” If you’re already on a video page, tap the down arrow in the player to save the video for offline viewing. Once the download completes, your 360 video can be accessed in the Offline tab of your Library. 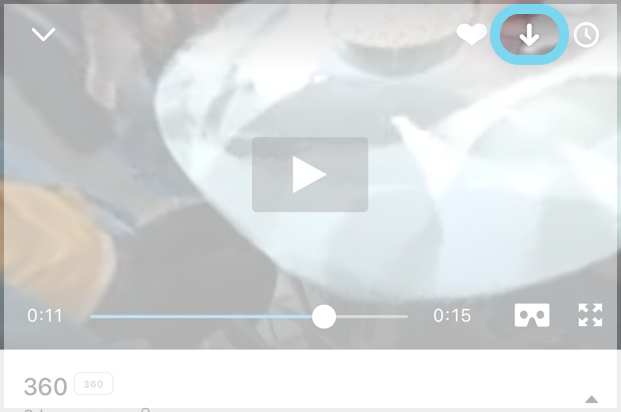 On desktop, click the "Download" button that appears below the video player. From there, you’ll have the option to select a quality to download from the menu. When viewing locally, please make sure to use a player that supports 360 video. We recommend using a program such as VLC media player. If the video owner has disabled downloading, you won’t see the Download button on the video page on desktop. Vimeo supports both monoscopic and stereoscopic 360 video. Monoscopic is filmed using one camera per field of view from one single point of view, whereas stereoscopic has a separate video mapped to each eye. Both types of 360 video can be enjoyed with or without a headset, but the viewing experience for stereoscopic 360 video is optimized for a headset. Please note: All mobile devices will require a built in gyroscope sensor for 360 video playback. If a 360 video is played from a device without this sensor, the video will not be rendered for 360 and will play as flat. If you are having trouble viewing in 360 from your mobile device, please consult your device documentation to make sure the gyroscope sensor is included. 360 video playback is not currently supported in any mobile browsers for iOS and the Vimeo TV apps. Vimeo supports 360 video (monoscopic and stereoscopic), not true VR. While the terms are often used interchangeably, 360 video and VR are considered two different experiences. 360 video is recorded from all angles using a special rig of multiple cameras or one omnidirectional camera. Users can dictate the direction or view of the video based on a central point in space, dictated by the camera. These videos can be viewed in a headset or on a screen. VR (virtual reality) refers to a simulated digital environment in which a user can physically move around and interact using equipment such as a headset and body gear. Users can navigate, control, and influence the environment beyond the direction they are looking. Vive supports curated Vimeo content on their Vive Video app, which means that staff-picked Vimeo videos are available to watch on Vive and Oculus headsets. You can download the app on Steam as well as on Viveport and use it to discover staff picked videos. Please note that the app contains pre-curated videos (i.e. it's not possible to download the Vimeo app and use it to watch your own videos on those headsets).